We managed 26 days. Which means, in Whole30 terms, we failed and we should go back to day 1 and start again. But I consider myself an optimist, and I also consider 26 days of home-cooking 3 healthy, unprocessed, nutritious meals a day a pretty damn awesome achievement. Did you know that supermarket bacon contains sugar? Smoked salmon? Did you know that ‘healthy’ shop-bought almond milk contains a raft of preservatives? Did you ever look at the number of unpronounceable ingredients in a stock cube? Yeah, neither did we. The biggest and undoubtedly most valuable learning from our Whole30 was the value of unprocessed, preservative-free, nutritious food. 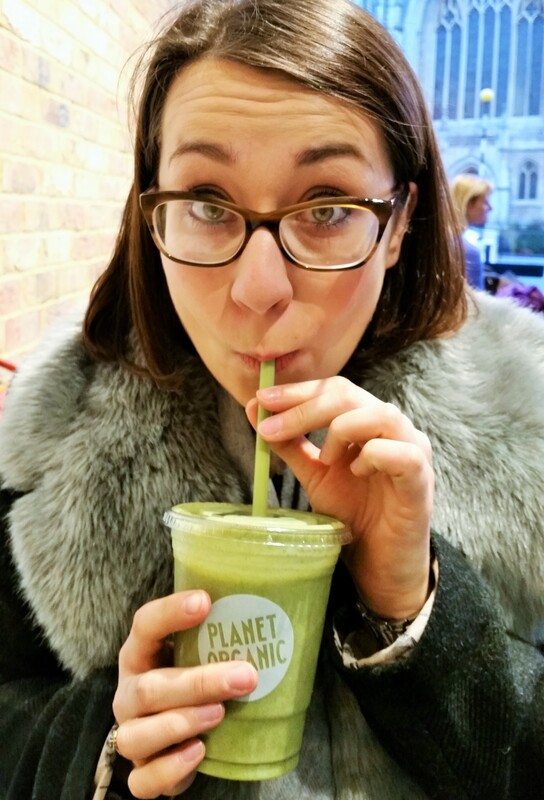 We were surprised – and often pissed off – by how hard it was to find food that was Whole30 ‘compliant’ (yes, that’s the official Whole30 word for it), but, ultimately, the feeling of knowing that everything we put in our bodies was natural and unprocessed was hugely satisfying. I would urge anyone out there to take a little closer look at some of the labels on the foods you buy; if you don’t recognise any of the words, there are more than 5 ingredients or things that sound…well…just plain wrong (maltodextrin, anyone?! ), maybe think about putting it back and finding a more…real alternative. We had fallen into the big-city-busy-twenty-something food trap; we shopped frequently and without planning, relied on convenience foods (hello ‘healthy’ ready meals from Sainsbury’s opposite my office), and, though we had made a concerted effort to start eating more healthily, we were fairly unimaginative and repetitive in our choices. Whole30 forced us to do a total 360. We had to shop (and shop big), plan, prepare-ahead and get creative to keep us engaged and enjoying the challenge. Sure, you could do Whole 30 by eating the same 6 meals on rotation, but you’d probably find yourself in a very dark place (possibly one where the people walking around are giant sandwiches and snickers bars) by day 10. This was the part we really loved; finding new ways to add colour, texture, crunch and depth of flavour without relying on old friends like bread or flours, sugar or stock cubes. Keeping eggs interesting when you’ve eaten about four of them a day. Every day. For two weeks. Creating vibrant, colourful, filling meals that make you feel like you’re thriving. I’ll be writing another post soon about some of the favourite Whole30 / Paleo recipes. The promise of soaring energy levels was one of the key things that attracted me to Whole30. I don’t know about you, but since I was a kid, I’ve needed snacks to get me through the day. That standard British routine of elevenses – a cheeky biscuit and a cup of tea and hour before lunch. Just to get you through. Then, of course, the 3 o’clock snack; vital to counteract the energy slump that makes you hope your boss’ meeting overruns so you can curl up under your desk for a nap. I’ve had days when I’ve sat in the loo for 5 minutes just to ‘re-charge’ – don’t pretend you’ve never done it! But on Whole30, I found that my energy levels were stable. This was pretty astounding. They were also not only stable, but tending towards higher levels that I’m used to – inevitably, I felt brighter, perkier and got more done in my days. Weirdly, I didn’t have one evening where I came home and climbed into my PJs at 6pm – a revelation! I wouldn’t say I felt superhuman, but after an hour on the Tube in rush hour, who can?! I’d be a bare-faced liar if I told you that I didn’t consider the potential weight-loss when making my decision to undertake Whole30. But unlike other diets I’ve done, it was by no means the most important (or even the 5th most important) reason for taking it on. But I can’t deny the results. I lost 10 pounds in 30 days. 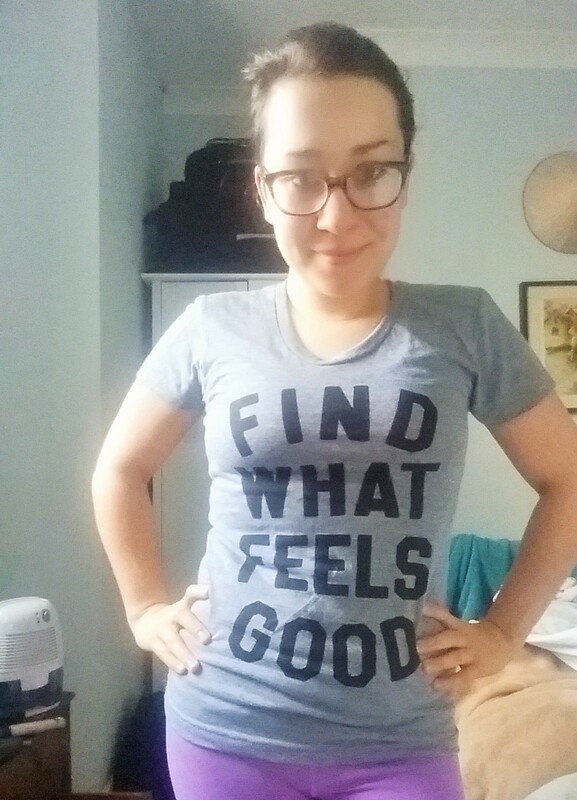 I’ve dropped a dress size, and bought a pair of size 10 jeans for pretty much the first time since I was about 14. James has undoubtedly lost over a stone, but he chose not to weigh himself before or afterwards, sensibly focusing on how he feels instead. The programme outlaws weighing yourself during the 30 days and explicitly says that this is not about weight loss, and I actually totally agree. Reconnecting with what I was eating and how I was fuelling my body by far trumps the weight loss; but it’s a nice bonus. Eating out with loved ones is one of my favourite things in the world. There’s a simple joy in coming together somewhere new and exciting, pouring over the sensual prose of the menu. Tasting, sharing, laughing and enjoying food together. Not so fun? Sitting at a table agonising over whether your meat might be cooked in olive oil, quizzing your waiter on what the vegetables are cooked in and switching five of the ingredients on your plate. Yes, this is part of the challenge. My advice is – where turning into a hermit isn’t an option – wherever you can, pick the restaurant. Peruse the menu beforehand and figure out what you can have. Because…cake. You know? And because my boyfriend is pretty much in love with his Tassimo machine and had to look wistfully at his selection of fancy coffees every day as he made his plain espresso (he learned quickly that coconut milk that left a layer of sludge in his coffee was never gunna cut it). 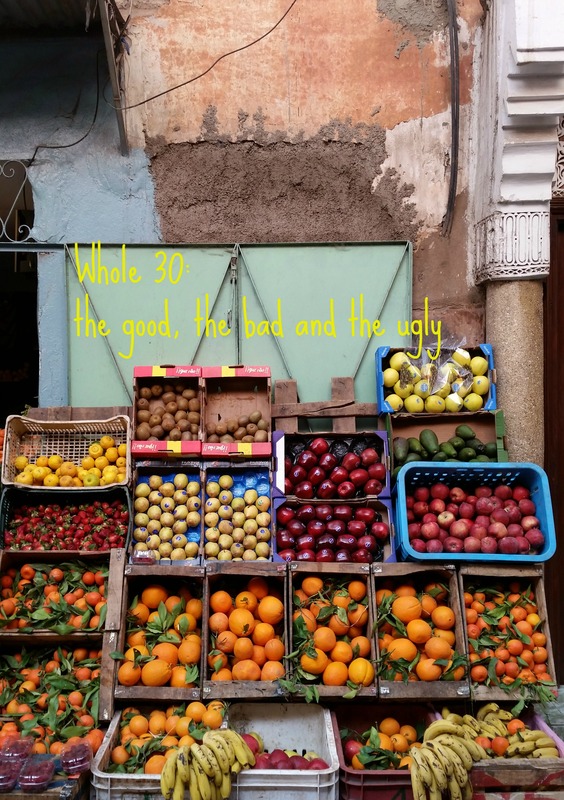 While there are a wealth of benefits to taking part in a Whole30, towards the end of my challenge I felt a growing sense of unease at how my attitude to it was evolving. Day 20 saw me heading on holiday to Marrakesh with my mam. The prospect was stressful and unsettling; how would I stay compliant without being able to make my own food? I felt guilty for ordering orange juice, for eating some potatoes that might have been borderline classed as chips. The programme’s rigid structure and comply-or-die communications strategy was what made it, for me, simultaneously straightforward and intimidating in equal measure. My personal opinion is that any programme – 30 days or not – that restricts several major food groups entirely with absolutely zero wiggle room is setting you up for failure – of, if you do manage to hang in there, for feelings of anxiety and guilt about accidentally ‘cheating’ or lusting about ‘cheat’ foods. But bravo if you’re one of those who didn’t experience any of this, I tip my hat to you! Me? I think food should be a little more fun. I like to enjoy my food. To create, taste, experiment, praise and devour. Which is why, on my 27th birthday – AKA day 26 – after working my arse off to stay ‘compliant’ in Morocco (and probably failing) I enjoyed a couple of glasses of Malbec with my family and my (compliant) dinner of fish stew. And you know what? It was bloody delicious and I don’t regret one drop of it. I saw someone on the Whole30 Instagram feed the other day mocking a woman who had tweeted Melissa Hartwig (Whole30 Founder) saying she felt it too restrictive and difficult to take part. The IG-er, a fellow Whole30-er, suggested that this woman obviously just didn’t want it enough. And I think, in the end, neither did I. What I had wanted was to eat real, healthy, energy-giving, fun foods and feel, strong, positive and powerful. And when it stopped making me feel good, it was time to call it a day for me. My plan is to continue with a broadly Paleo lifestyle with a roughly 80 / 20 rule. Because life is too damn short not to eat cake!